← Der Berliner Currywurst Möchte Ich Noch Gerne! I have always wondered how long congee hawkers take every morning to cook their pots of rice porridge. It must take a lot of time and patience to cook it – which means they would have to wake up in the wee hours of the morning, every morning, to prepare it. It’s definitely not an easy job to manage, especially since most of them still use the conventional method of cooking their porridge over large stoves of fire. Until I got hold of a slow cooker for myself during my confinement period and had a chance to cook congee for the both of us. It was really easy. No monitoring or adjustment of any stove fire is needed. The small cup of rice would suddenly disappear and dissolve into a pool of edible wool after a couple of hours. It’s definitely a great dish to whip up before one leaves for work – a simple and yummy dish for a working mum like myself to prepare during a busy work week, to keep my family happy and contented. Add rice, ginger, red dates, water and chicken stock cubes into slow cooker. Cover and cook on high for 3 hrs. Once the porridge texture forms, add wolfberries, salt & chicken. Cover and cook on low heat for 30 min. Serve hot with light soy sauce, sesame oil and pepper. This recipe was kindly adapted from Roti & Rice’s ‘Slow Cooker Rotisserie Chicken Congee‘. I substituted rotisserie chicken for plain chicken breast, used chicken stock cube instead of chicken stock and added chicken only in the last 30 min before serving. The red dates and wolfberries did give a slightly sweet taste to the congee in general, though this version isn’t one I would find anywhere outside nor one I am used to eating since young. It is indeed tasty, but I am most likely to make do without the dates and berries the next time I cook congee again, simply because I have a huge preference for savoury flavours! Omit step 3 above and continue cooking the porridge for 4 hrs for a simpler version of this recipe. 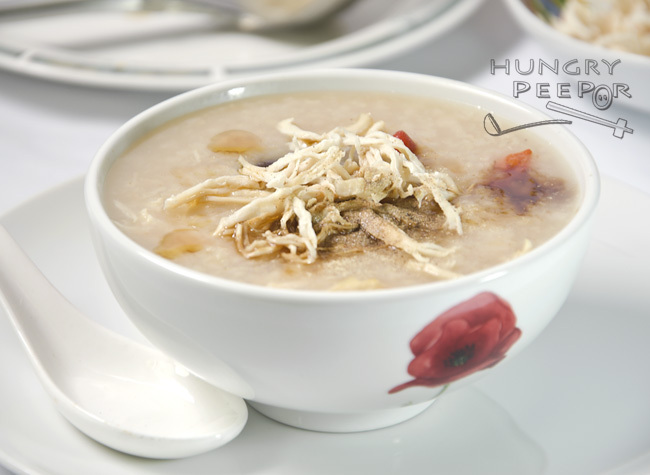 You can also serve the porridge with shredded ginger, which is typical of the Cantonese way of serving porridge. Do not add too much salt into the pot of congee. Instead, offer light soy sauce for serving so that the level of saltiness can be adjusted according to each individual’s preference. This entry was posted in Chinese, Rice and tagged Boiled, Cantonese, Chicken, Porridge. Bookmark the permalink.